• Brucker, M. J.; McMillan, R. S.; Bressi, T. H.; Larsen, J. A.; Mastaler, R. A.; Read, M. T.; Scotti, J. V.; and Tubbiolo, A. F. 2017. Update on Spacewatch Observations of Near-Earth Objects. In Division for Planetary Sciences Meeting Abstracts, vol. #49, id.112.08: 2017DPS....4911208B . Poster presented at 2017 DPS meeting. McMillan, R. S., T. H. Bressi, J. A. Larsen, R. A. Mastaler, M. T. Read, A. F. Tubbiolo, and J. V. Scotti. 2016. Increasing the Output of Spacewatch Astrometry of Near-Earth Asteroids. In Division for Planetary Sciences Meeting Abstracts, vol. 48. 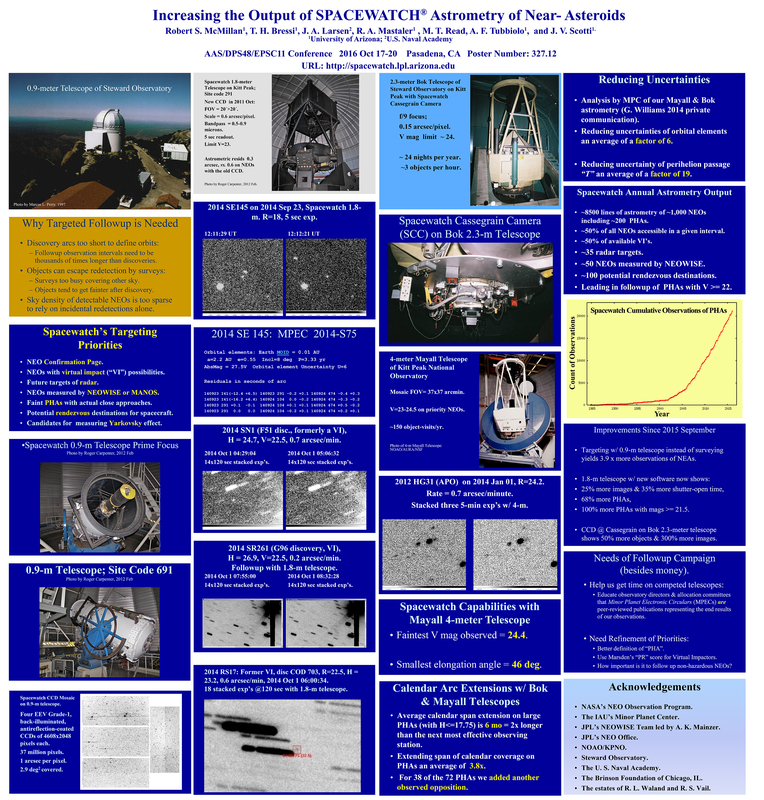 #327.12: 2016DPS....4832712M Poster presented at 2016 DPS meeting (JPG). Scotti, J. V., R. S. McMillan, and J. A. Larsen. 2014. Spacewatch Astrometry of Asteroids and Comets with the Bok 2.3-m and Mayall 4-m Telescopes. In AAS/Division for Planetary Sciences Meeting Abstracts, vol. 46. #414.17. 2014DPS....4641417S and poster of 2014DPS....4641417S (PDF) of the poster. McMillan, R. S., T. H. Bressi, J. V. Scotti, J. A. Larsen, and R. A. Mastaler. 2014. In AAS/Division for Planetary Sciences Meeting Abstracts, vol. 46. #414.11. 2014DPS....4641411M and poster of 2014DPS....4641411M (PDF). McMillan, R. S.; Bressi, T. H.; Scotti, J. V.; Larsen, J. A.; Perry, M. L. 2012. American Astronomical Society, DPS meeting #44, #210.14: Spacewatch Observations of Near-Earth Objects. Abstract at 2012DPS....4421014M and poster at Spacewatch Observations of Near-Earth Objects (PPT). McMillan, R. S., T. H. Bressi, J. A. Larsen, C. K. Maleszewski, J. L. Montani, J. V. Scotti. 2010. Spacewatch Observations of Asteroids and Comets with Emphasis on Discoveries by WISE. AAS/DPS Poster (PDF) 13.22 Thurs. 2010 Oct 7: 15:30-18:00. Haskell, H, and J. Larsen. 2009. The Size Distribution of the Small Near Earth Asteroids from Spacewatch. AAS Meeting #213, #401.11; poster abstract. McMillan, R. S., A. K. Mainzer, R. G. Walker, E. L. Wright, P. R. Eisenhardt, R. M. Cutri, T. Grav, and the WISE Science Team. 2009. NEOWISE: Proposed Discovery of Near-Earth Objects in the Infrared by the WISE Mission. AAS Meeting #213, #459.06.; abstract, and poster (pdf file). McMillan, R. S. 2009. Spacewatch Support of Deep Wide-Field NEO Surveys (PDF); White Paper submitted to NRC Committee to Review Near-Earth Object Surveys and Hazard Mitigation Strategies, and PDF format Powerpoint slide series to accompany presentation to the Committee on 2009 April 20. McMillan, R. S., and the WISE Team. 2009. Abstract of WISE Solar System Science, talk presented at 214th Meeting of the American Astronomical Society, 2009 June 9, Presentation No. 217.02, and slides of WISE Solar System Science (PDF). Larsen, J. A., et al. 2007. The Search for Distant Objects in the Solar System Using Spacewatch. The Astron. J., 133: 1247-1270. McMillan, R. S., and the Spacewatch Team. 2006. "Spacewatch Preparations for the Era of Deep All-sky Surveys". Slides presented 2006 August 16 (PDF) to IAU Symposium 236, "Near Earth Objects, our Celestial Neighbors: Opportunity and Risk", in Prague, at the 26th IAU General Assembly. Gural, Peter S.; Larsen, Jeffrey A.; Gleason, Arianna E.; "Matched Filter Processing for Asteroid Detection." The Astron. J, 130: 1951-1960. Larsen, J. A., and the Spacewatch Team. 2005. "The size distribution of small near-Earth asteroids from the Spacewatch Survey". BAAS, 37, No. 4, abstract 4.09. McMillan, R. S. 2005. Review of book entitled, Mitigation of Hazardous Asteroids and Comets, in Meteoritics and Planetary Science, 40, 509. McMillan, R. S., M. Block, A. S. Descour. 2005. "The Spacewatch Volunteer Search For Fast Moving Objects" The ALPO Minor Planet Bulletin, Volume 32, Number 3 : p53. Roe, E. A, J. A. Larsen, and the Spacewatch Team. 2005. "Search for the tenth planet: Testing inferences from the 'Kuiper cliff' ". BAAS, 37, No. 4, abstract 4.07. Cabanela, J. E., R. M. Humphreys, G. Aldering, J. A. Larsen, S. C. Odewahn, P. M. Thurmes, and C. S. Cornuelle. 2003." The Automated Plate Scanner Catalog of the Palomar Sky Survey. II. The Archived Database." Publications of the Astronomical Society of the Pacific, 115: 837-843. Jedicke, R., A. Morbidelli, T. Spahr, J-M. Petit, W. F. Bottke Jr. 2003. " Earth and Space-based NEO Survey Simulations: Prospects for Achieving the Spaceguard Goal." Icarus, 161: 17-33. Larsen, J. A., R. M. Humphreys. 2003." Fitting A Galactic Model To An All-Sky Survey." The Astron. J. , 125: 1958-1979. Bottke, W.F., A. Morbidelli, R. Jedicke, J-M. Petit, H. Levison, P. Michel, and T.S. Metcalfe. 2002. "Debiased Orbital and Size Distributions of the Near-Earth Objects." Icarus, 156: 399-433. Jedicke, R. 2002. "Intermediate Impact Factors." Nature, 420: 273-274. Jedicke, R., J. Larsen, and T. Spahr. 2002. " Observational Selection Effects in Asteroid Surveys and Estimates of Asteroid Population Sizes." Asteroids III (W. Bottke et al., eds.). University of Arizona, Tucson, 71-87. Levison, H. F., A. Morbidelli, R. Jedicke, P. A. Wiegert, W. F. Bottke, Jr., L. Dones. 2002." The Mass Disruption of Oort Cloud Comets." Science, 296: 2212-2215. McMillan, R. S., T. H. Bressi, A. S. Descour, T. Gehrels, A. E. Gleason, R. Jedicke, J. L. Montani, M. L. Perry, M. Read, J. V. Scotti, A. F. Tubbiolo. 2002. "A Progress Report on Spacewatch." International Workshop on Collaboration and Coordination Among NEO Observers and Orbital Computers (held at the Kurashiki City Art Museum, Japan from October 23 to 26, 2001). S. Isobe and Y. Asakura, Eds. (Published by Japan Spaceguard Association). 7-10. Morbidelli, A., R. Jedicke, W.F. Bottke, P. Michel, E.F. Tedesco. 2002. "From Magnitudes to Diameters: The Albedo Distribution of Near Earth Objects and the Earth Collision Hazard." Icarus 158: 329-342. Bottke, W.F., A. Morbidelli, R. Jedicke, J-M. Petit, H. Levison. 2001. "Debiased Orbital and Size Distributions of the NEOs." Abstract Bull. Amer. Astron. Soc., 33, 1195. Jedicke, R., A. Morbidelli, T. Spahr, J.-M. Petit, W. Bottke. 2001." Earth and Space-based NEO Survey Simulations: Prospects for Achieving the Spaceguard Goal." Abstract. Bull. Amer. Astron. Soc., 33, 1138. Larsen, J., A. E. Gleason, N. M. Danzl, A. S. Descour, R. S. McMillan, T. Gehrels, R. Jedicke, J. L. Montani, J. V. Scotti. 2001. "The Spacewatch Wide Area Survey for Bright Centaurs and Transneptunian Objects." The Astron. J., 121: 562-579. Morbidelli, A., W. F. Bottke, R. Jedicke, P. Michel, E. F. Tedesco. 2001. "NEO Albedo Distribution and Impact Hazards." Abstract. Bull. Amer. Astron. Soc., 33, 1137. Bottke, W. F., R. Jedicke, A. Morbidelli, J. Petit, & B. Gladman, 2000. "Understanding the Distribution of Near-Earth Asteroids." Science, 288: 2190-2194. Gehrels, T., and L. Ksanfomality. 2000. "The Search for Earth-Approaching Comets and Asteriods". Solar System Research, Issn 0038-0946, Kluwer Academic Publishers. January, 34: 37-48. And in the Russian edition ("Astronomicheskii Vestnik", ISSN 0320-930x): Poisk sblijayuschihsya s Zemleii komet i asteroidov, January, 34: 41-54. Larsen, J. 2000. "The Preservation and Enhancement of the Spacewatch Data Archives." Abstract in B.A.A.S., 32: 1018. McMillan, R. S., M. L. Perry, T. H. Bressi, J. L. Montani, A. F. Tubbiolo, and M. T. Read. 2000. "Progress on the Spacewatch 1.8-m Telescope and Upgrade of the Spacewatch 0.9-m Telescope." Abstract in B.A.A.S., 32: 1042. Bhandari, N., and T. Gehrels 1999. "Killer Comets and Asteroids Over Geologic History and their Future Hazards." In Space Research in India: Accomplishments and Prospects. (Ahmedabad, India: PRL Alumni Assoc. ), Eds. M. S. Narayanan et al. : 315-334. Bottke, W. F., R. Jedicke, A. Morbidelli, B. Gladman, J. M. Petit 1999. "Understanding the Distribution of Near-Earth Asteroids." Abstract in B. A. A. S. 31: 1116. Gehrels, T., and E. Echternach. 1999. "Beautiful but dangerous". Zenit 10:416-423, (in Dutch). Gehrels, T. 1999. "The Binzel Scale of Asteroid Hazards." CCNet Digest http://abob.libs.uga.edu/bobk/cccmenu.html, July 23. McMillan, R. S. 1999. "Spacewatch Discovery and Study of Accessible Asteroids." Abstract of paper presented at the Space Resources Utilization Roundtable at the Colorado School of Mines in Golden, CO: LPI Contrib. No. 988 and http://www.mines.edu/research/srr. McMillan, R. S. 1999. "The Spacewatch Search for Material Resources Near Earth." Space Manufacturing 12: Challenges and Opportunities in Space: Proceedings of the Fourteenth Space Studies Institute's Princeton Conference on Space Manufacturing, May 6-9, 1999, B. Greber, Ed. (SSI Publishing, Princeton, NJ), 72-75. McMillan, R. S. 1999. "Why Was the Earth-Approaching Asteroid 1998 OX4 Lost, and Was It a Big Deal To Lose It?" CCNet Digest June 14. Morbidelli, A., W. F. Bottke, R. Jedicke, B. Gladman, J. -M. Petit 1999. "The Debiased Distribution of NEAs." Abstract in B. A. A. S. 31: 1116. Ostro, S. J., P. Pravec, L. A. M. Benner, R. S. Hudson, L. Sarounova, M. D. Hicks, D. L. Rabinowitz, J. V. Scotti, D. J. Tholen, M. Wolf, R. F. Jurgens, M. L. Thomas, J. D. Giorgini, P. W. Chodas, D. K. Yeomans, R. Rose, R. Frye, K. D. Rosema, R. Winkler, & M. A. Slade. 1999. "Radar and Optical Observations of Asteroid 1998 KY26." Science 285: 557-559. Durda, D. D., R. Greenberg, and R. Jedicke (1998) "Collisional Models and Scaling Laws: A New Interpretation of the Shape of the Main-belt Asteroid Size Distribution" Icarus, 135: 431-440. Gehrels, T. 1998. "Detecting Asteroids (Parts I and II)." Meteorite! 2: 18-20 and 3: 18-21. Jedicke, R. and T. S. Metcalfe. 1998. "The Orbital and Absolute Magnitude Distributions of Main Belt Asteroids." Icarus, 131: 245-260. Larsen, J. A. 1998. "Spacewatch Survey for Bright Kuiper-Belt Objects." Abstract in Exploring the Kuiper Belt: Where do We Go from Here?" (Workshop at Lowell Observatory), Sept. 2-5, 1998. Larsen, J. A. 1998. "The Spacewatch Survey for Bright Kuiper Belt Objects." Abstract in B. A. A. S. 30: 1113. McMillan, R. S., T. H. Bressi, T. Gehrels, R. Jedicke, J. A. Larsen, J. L. Montani, M. L. Perry, M. T. Read, J. V. Scotti, A.F. Tubbiolo. 1998. "Spacewatch: Findings and Progress." Abstract for First LPL Conference, 1998 May 18-19. McMillan, R. S. 1998. "Applicability of the Spacewatch Telescopes to the Exploration of the Outer Solar System." Abstract in Exploring the Kuiper Belt: Where do We Go from Here? (Workshop at Lowell Observatory), Sept. 2-5, 1998. McMillan, R. S., T. H. Bressi, A. S. Descour, T. Gehrels, J. A. Larsen, J. L. Montani, M. L. Perry, M. T. Read, and A. F. Tubbiolo 1998. "Progress Report on the 1.8-meter Spacewatch Telescope." Abstract in B. A. A. S. 30: 1114. McMillan, R. S. 1998. "Exploration of Asteroid and Comet Populations." SSI Update - The High Frontier Newsletter, (Princeton, NJ: Space Studies Institute), 23, issue 5, 2: 5-6. Perry, M. L., T. H. Bressi, R. S. McMillan, A. F. Tubbiolo, and L. D. Barr 1998. "The 1.8m Spacewatch Telescope Motion Control System." Proc. SPIE 3351, Telescope Control Systems III, 450-465. Scotti, J. V. 1998. "Fleeting Expectations: The Tale of an Asteroid." Sky and Telescope 96, 1: 30-34. Gehrels, T. 1997. "A Proposal to the United Nations Regarding the International Discovery Programs for Near-Earth Asteroids." In Near-Earth Objects, Annals of the New York Academy of Sciences, 822: 603-605. Gehrels, T. 1997. "Spacewatch." The Encyclopedia of Planetary Science, eds. R. Fairbridge and J. Shirley (London: Chapman and Hall): 774-775. Jedicke, R., and J. D. Herron. 1997. "Observational Constraints on the Centaur Population." Icarus, 127: 494-507. McMillan, R. S. 1997. "Charge-Coupled Devices." The Encyclopedia of Planetary Science, eds. R. Fairbridge and J. Shirley , (London: Chapman and Hall), 98-102. Wisniewski, W. Z., T. M. Michalowski, A. W. Harris, and R. S. McMillan. 1997. "Photometric Observations of 125 Asteroids." Icarus 126: 395-449. Bailey, M. E., V. V. Emel’yanenko, G. Hahn, N. W. Harris, K. A. Hughes, K. Muinonen, and J. V. Scotti. 1996. "Orbital Evolution of Comet 1995 01Hale-Bopp." MNRAS, 281: 916-924. Gehrels, T. 1996. "Collisions with Comets and Asteroids." Scientific American, 274: 34-39. And in 2000 reprinted in Scientific American Anthology: Earth From the Inside Out, 90-95. Gehrels, T. 1996. "Kometen und Planetoiden - Risiko für die Erde?" Spektrum der Wissenschaft, November issue: 92-98 (in German). Gehrels, T., J. D. Herron, R. Jedicke, R. S. McMillan, T. S. Metcalfe, J. L. Montani, J. Nichol, and J. V. Scotti. 1996. "Spacewatch Survey for Trans-Neptunian Objects." Abstract in B.A.A.S. 28:1081. Jedicke, R. 1996. "Detection of Near-Earth Asteroids Based upon their Rates of Motion." Astron. J.: 970-982. Metcalfe, T. S., and R. Jedicke. 1996. "Spacewatch Model-Independent Technique for Correcting Observational Bias." Abstract in B.A.A.S. 28:1096. Scotti, J. V. 1996. "Near-Earth Object Surveying in the Late 20th Century." Completing the Inventory of the Solar System, eds. T.W. Rettig, and J.M. Hahn, ASP Conf. Series, 107:107-113. Scotti, J. V. 1996. "Physical and Dynamical Evolution of Comets." Abstract B.A.A.S. 28: 1086. Scotti, J. V., and R. Jedicke. 1996. "Observation of Small Solar System Objects with Spacewatch." Dynamics, Ephemerides, and Astrometry of the Solar System, eds. S. Ferraz-Mello et. al., (Kluwer): 389-398. Gehrels, T. 1995. "The Beauty and Danger of Comets and Asteroids." Vainu Bappu Lecture. Supplement to J. Astrophys. Astr. (India), 16: 1-34. Gehrels, T., 1995. "The Spacewatch Report No. 6." ed. T. Gehrels. Gehrels, T., R. Jedicke, R. S. McMillan, M. L. Perry, J. V. Scotti, and T. Bressi. 1995. "CCD Scanning for the Discovery of Comets and Asteroids." In Proc. Of the Planetary Defense Workshop, Lawrence-Livermore National Laboratory CONF-9505266: 125-127. Gehrels, T., and R. Jedicke. 1995. "The Population of Near-Earth Objects Discovered by Spacewatch." In Earth, Moon, and Planets, 72: (Kluwer Academic Publishers): 233- 242. Jedicke, R. 1995. "Automated CCD Scanning for Near-Earth Asteroids." New Developments in Array Technology and Applications, eds. A.G. Davis Philip et. al. (Kluwer): 157-165. Jedicke, R., and J. V. Scotti. 1995. "Discovery and Confirmation of the Comet 1995 A1." IAUC 6124. Spacewatch. 1995. Recoveries and Observations. IAUC 6125, 6127, 6139, 6161, 6176, 6177, 6180, 6199, 6219, 6249, 6258 and 6264. Weaver, H. A., M. F. A’Hearn, C. Arpigny, D. C. Boice, P. D. Feldman, S. M. Larson, P. Lamy, D. H. Levy, B. G. Marsden, J. K. Meech, K. S. Noll, J. V. Scotti, Z. Sekanina, C. S. Shoemaker, E. M. Shoemaker, T. E. Smith, S. A. Stern, A. D. Storrs, J. T. Trauger, D. K. Yeomans, and B. Zellner. 1995. "The Hubble Space Telescope (HST) Observing Campaign on Comet Shoemaker-Levy 9." Science, 267: 1282-1288. Carusi, A., T. Gehrels, E. F. Helin, B. G. Marsden, K. S. Russell, C. S. Shoemaker, E. M. Shoemaker, and D. I. Steel. 1994. "Near-Earth Objects: Present Search Programs." In Hazards Due to Comets and Asteroids, ed. T. Gehrels (Tucson: Univ. Of Ariz. Press): 1300 pp. Gehrels, T. 1994. "La Vedetta del Kitt Peak." L’Astronomia 146:12-20. Gehrels, T. 1994. "The Spacewatch Program." Proc. Of Erice Conf. Larson, H. P., J. Montani, L. A. Lebofsky, A. Rivkin, E. Howell, and C. Moran. 1994. "Volatiles in Asteroidal Surface Minerals." Abstract in B.A.A.S. 26:1175. Scotti, J. V. 1994. "In Memoriam: Wieslaw Z. Wisniewski." Icarus, 112: 300-301. Scotti, J. V. 1994. "Wieslaw Z. Wisniewski, 1931-1994." Abstract in B.A.A.S. 26: 1611-1612. Scotti, J. V. 1994. "Computer Aided Near-Earth Object Detection." Asteroids, Comets, and Meteors 1993, eds. A. Milani et al., : 17-30. Scotti, J. V., R. Jedicke. 1994. "Discovery and Confirmation of the Periodic Comet Harrington (1994g)." IAUC 6089. Spacewatch. 1994. Recoveries and Observations. IAUC 5933, 5954, 5967, 5982, 5984, 5986, 6004, 6072, 6084, and 6121. Weaver, H. A., P. D. Feldman, M. F. A’Hearn, C. Arpigny, R. A. Brown, E. F. Helin, D. H. Levy, B. G. Marsden, J. K. Meech, S. M. Larson, K. S. Noll, J. V. Scotti, Z. Sekanina, C. S. Shoemaker, E. M. Shoemaker, T. E. Smith, A. D. Storrs, D. K. Yeomans, and B. Zellner. 1994. "Hubble Space Telescope Observations of Comet Shoemaker-Levy 9 (1993e)." Science, 263: 787-791. Drummond, J., D. L. Rabinowitz, and M. Hoffmann. 1993. "On the Search for Near- Earth Asteroids." Resources of Near-Earth Space, eds. J. S. Lewis, M. S. Matthews, M. L. Guerrieri (Tucson: Univ. Of Ariz. Press): 449-472. Gehrels, T., D. L. Rabinowitz, R. S. McMillan, M. L. Perry, and J. V. Scotti. 1993. "Spacewatch Results." Abstract in B.A.A.S. 25: 1125. Rabinowitz, D. L., T. Gehrels, J. V. Scotti, R. S. McMillan, M. L. Perry, W. Wisniewski, S. M. Larson, E. S. Howell, and B. E. A. Mueller. 1993. "Evidence for a Near-Earth Asteroid Belt." Nature 363: 704-706. Rabinowitz, D. L. 1993. "The Flux of Small Asteroids Near the Earth. Zc Asteroids, Comets, and Meteors 1991." eds. A. Harris and E. Bowell (Houston: Lunar and Planetary Inst. ): 481-485. Rabinowitz, D. L. 1993. "The Size Distribution of the Earth-Approaching Asteroids." Astrophysical Journal 407: 412-427. Rabinowitz, D. L., T. Gehrels 1993. " Discovery and Confirmation of the Asteroid 1993 KA." IAUC 5797. Rabinowitz, D. L. 1993. " Discovery and Confirmation of the Asteroid 1993 KA2." IAUC 5817. Rabinowitz, D. L., R. H. McNaught, D. I. Steel and C. Pollas. 1993. " Discovery and Confirmation of the Asteroid 1993 HA2." IAUC 5789. Scotti, J. V., and H. J. Melosh. 1993. "Estimate of the Size of Comet Shoemaker-Levy 9 from a Tidal Breakup Model." Nature 365: 733-735. Scotti, J. V., S. M. Larson. 1993. "Discovery and Confirmation of the Periodic Comet Spitaler (1993r)." IAUC 5885. Scotti, J. V. 1993. "Discovery and Confirmation of the Asteroid 1993 PB." IAUC 5843. Scotti, J. V., D. L. Rabinowitz. 1993. "Discovery and Confirmation of the Asteroid 1993 EA = 1984 AJ." IAUC 5721. Spacewatch. 1993. Recoveries and Observations. IAUC 5696, 5698, 5725, 5729, 5745, 5772, 5805, 5806, 5807, 5826, 5827, 5832, 5882, 5892, 5902, 5906 and 5908. Bailey, M. E., J. E. Chambers, G. Hahn, J. V. Scotti, and G. Tancredi. 1992. "Transfer Probabilities between Jupiter and Saturn-family Orbits: Application to 1992 AD = 5145." Observations and Physical Properties of Small Solar System Bodies, eds. J. Surdej and J. C. Gerard, Proc. 30th Liège Int. Astrophys. Coll., Univ. Of Liège, Belgium, 285-287. Gehrels, T., M. Guerrieri, M. S. Matthews, R. S. McMillan, M. L. Perry, D. L. Rabinowitz, and J. V. Scotti. 1992. "Spacewatch and Spaceguard." AIAA Space Programs and Technologies Conf. (NY: AIAA) 92:1498. Gehrels, T. 1992. "The Hazards Due to Comets and Asteroids." Abstract in B.A.A.S. 24: 965. Rabinowitz, D. L., J. V. Scotti, T. Gehrels, W. Wisniewski, S. Larson, E. Howell, and B. E. A. Mueller. 1992. "Peculiar Asteroids with Earth-like Orbits" Abstract in B.A.A.S. 24: 964. Rabinowitz, D. L., and J. V. Scotti. 1992. "Discovery and Confirmation of the Comet Spacewatch (1992h)." IAUC 5509. Rabinowitz, D. L., E. F. Helin, J. Alu and K. Lawrence. 1992. "Discovery and Confirmation of the Asteroid 1992 AE." IAUC 5436. Rabinowitz, D. L., C. S. Shoemaker, E. M. Shoemaker, and D. H. Levy. 1992. "Discovery and Confirmation of the Asteroid 1992 AD." IAUC 5434. Scotti, J. V., T. Gehrels, and D. L. Rabinowitz. 1992. "Automated Detection of Asteroids in Real-time with the Spacewatch Telescope." Asteroids, Comets, and Meteors 1991, eds. A. Harris and E. Bowell (Houston: Lunar and Planetary Inst): 541-544. Scotti, J. V., D. L. Rabinowitz. 1992. "Discovery and Confirmation of the Asteroid 1992 JD." IAUC 5511. Spacewatch. 1992. Recoveries and Observations. IAUC 5472, 5490, 5513, 5618, 5620, 5623, 5624, 5643 and 5667. Gehrels, T., 1991. "The Spacewatch Report No. 5." eds. T. Gehrels and R. S. McMillan. Gehrels, T. 1991. "Scanning with Charge-Coupled Devices." Space Science Reviews, (Kluwer Academic Publishers), 58: 347-375. Gehrels, T., T. Nagatani, and T. Sato. 1991. "Spacewatch Project: Its Past, Present, and Future." The Heavens 72:134-139, (in Japanese). Gehrels, T., and J. V. Scotti 1991. "Discovery and Confirmation of the Comet Spacewatch (1991x)." IAUC 5341. Perry, M. L., and J. E. Frecker. 1991. "The Drive System of the Spacewatch CCD- Scanning Telescope." Abstract in B.A.A.S. 23: 875. Rabinowitz, D. L. 1991. "Detection of Earth-approaching asteroids in near real time." Astron. J. 101: 1518-1529. Rabinowitz, D. L., and J. V. Scotti. 1991. "Discovery and Confirmation of the Asteroid 1991 VA." IAUC 5383. Rabinowitz, D. L., and J. V. Scotti. 1991. "Discovery and Confirmation of the Asteroid 1991 BA." IAUC 5172. Scotti, J. V., D. L. Rabinowitz, and B. G. Marsden. 1991. "Near-Miss of the Earth by a Small Asteroid." Nature 354:287-289. Scotti, J. V. 1991. "Discovery and Confirmation of the Asteroid 1991 VG." IAUC 5387. Scotti, J. V. 1991. "Discovery and Confirmation of the Asteroid 1991 JR." IAUC 5264. Scotti, J. V. 1991. "Discovery and Confirmation of the Asteroid 1991 AM." IAUC 5166. Spacewatch. 1991. "Discovery and Confirmation of the Asteroids 1991 TT and 1991 TU." IAUC 5367. Spacewatch. 1991. Recoveries and Observations. IAUC 5192, 5195, 5280, 5285, 5343, 5350, 5351, 5366, 5385, 5391, 5401 and 5403. Gehrels, T. 1990. "Search for Near-Earth Asteroids with the Spacewatch Camera." Annual Report. NASA/UA Space Engineering Research Center. Gehrels, T. 1990. "Surveying of the Solar System." NASA Tech. Mem. 4205: 37 and 155. Gehrels, T., R. S. McMillan, J. V. Scotti, and M. L. Perry. 1990. "Drift Scanning with a TK 2048 CCD." Astron. Soc. Of Pacific Conf. Series, ed G.H. Jacoby (San Francisco: ASP), 8: 51-52. Gehrels, T., D. Rabinowitz and J. V. Scotti 1990. "Discovery and Confirmation of Apollos 1990 TG1, 1990 UN, 1990 UO." In IAUC 5130. Rabinowitz, D. L., J. V. Scotti, M. L. Perry, T. Gehrels, and R. S. McMillan. 1990. "Near Real-time Detection of Earth-Approaching Asteroids." Abstract in B.A.A.S. 22: 1117. Scotti, J. V. 1990. "Discovery and Confirmation of Asteroid 1990 SS." IAUC 5106. Spacewatch. 1990. Recoveries and Observations. IAUC 5033, 5035, 5117, 5129 and 5134. Gehrels, T. 1989. "CCD Scanning for Comets and Asteroids." NASA Tech. Mem. 4063: 39-145. Spacewatch. 1989. Observations. IAUC 4894 and 4917. Gehrels, T. 1988. On the Glassy Sea. (New York: American Inst. Of Physics, Inc.): 340 pp. Gehrels, T. 1988. "CCD Scanning for Comets and Asteroids." NASA Tech. Mem. 4063: 45 and 159. Spacewatch. 1988. Observation. IAUC 4555. Gehrels, T., J. D. Drummond, and N. A. Levenson. 1987. "The Absence of Satellites of Asteroids." Icarus 70: 257-263. Spacewatch. 1987. Recoveries and Observations. IAUC 4293, 4295, 4309, 4310, 4312, 4383, 4385, 4424, 4436, 4438, 4444, 4456, 4461, 4493, 4497 and 4498. Gehrels, T. 1986. "CCD Scanning." Asteroids, Comets, and Meteors, II." eds. C.-I. Lagerkvist, B. A. Lindblad, H. Lundstedt, and H. Rickman (Uppsala: Uppsala Universitet): 19-20. Gehrels, T. 1986. "On the Feasibility of Observing h the Galileo, Venera, and Comet-Rendezvous-Asteroid-Flyby Missions." Icarus 66:288-296. Gehrels, T., 1986. "The Spacewatch Report No. 4." eds. T. Gehrels and M. S. Matthews. Gehrels, T., B. G. Marsden, R. S. McMillan, and J. V. Scotti. 1986. "The Spacewatch Camera: A Progress Report." Proc. Lunar Planet. Sci. Conf. 17: 257. Gehrels, T. and F. Vilas. 1986. "CCD Search for Geosynchronous Debris." Icarus 68:412- 417. Gehrels, T., W. Z. Wisniewski, and T. Faÿ. 1986. "Light Variations of Comets." Asteroids, Comets, and Meteors, II. eds. C.-I. Lagerkvist, B. A. Lindblad, H. Lundstedt, and H. Richman (Uppsala: Uppsala Universitet): 337-339. McMillan, R. S., J. V. Scotti, J. E. Frecker, T. Gehrels, and M. L. Perry. 1986. "Use of a Scanning CCD to Discriminate Asteroid Images Moving in a Field of Stars." Proc. SPIE 627, Instrumentation in Astronomy, ed. D. L. Crawford, VI:141-154. Scotti, J. V. 1986. "Comet Review: 1985." Journ. A.L.P.O. 32: 21-15. Spacewatch. 1986. Recoveries and Observations. IAUC 4201, 4206, 4218, 4238, 4239, 4240, 4279 and 4280. Gehrels, N., T. Gehrels, J. V. Scotti, J. E. Frecker, and R. S. McMillan. 1985. "Optical Monitoring of Gamma-Ray Source Fields." 19th International Cosmic Ray Conference, Vol. 1 (NASA CP-2376): 19-22. Gehrels, T. 1985. "Observing Small Asteroids from Galileo, Venera, and CRAF Spacecraft." Abstract in B.A.A.S. 17: 731. Gehrels, T. 1985. "Photometry of Small Asteroids and Cometary Cores." NASA Tech. Mem. 89189: 89-90. Gehrels, T. 1985. "Asteroids and Comets." Physics Today 38: February 32-41. Gehrels, T., and J. V. Scotti. 1985. Photograph of Comet P/Giacobini-Zinner 1984e. IHW Newsl., 7:1-2. Scotti, J. V., T. Gehrels, and B. G. Marsden. 1985. "A New Magnitude System for Comets Observed with CCD." Abstract in B.A.A.S. 17: 725-726. Spacewatch. 1985. Recoveries and Observations. IAUC 4062,4088,4089,4095,4098,4126,and 4144. Frecker, J. E., T. Gehrels, R. S. McMillan, W. J. Merline, M. L. Perry, J. V. Scotti, and P. H. Smith. 1984. "A CCD System for Photometry of Direct and Spectroscopic Images." Proc. Of the NASA/SDSU Workshop on Improvements in Photometry, eds. W.J. Borucki and A. Young. (NASA CP-2350): 137-151. Gehrels, T. 1984. "Fundamental Studies of Asteroids." Bull. Astron. Soc. Of India 12:16- 39, L’Astronomie, March 1984, 98:115-132 and April 1984 159-170 (in French); Astrum 54: 5-13 (in Spanish), all featuring the Spacewatch Camera and its operations. Gehrels, T., 1984. "The Spacewatch Report No. 3," eds. T. Gehrels and M.S.Matthews. Gehrels, T. 1984. "Comparison of a 1.8-m CCD Scannerscope with a 1.2-m Schmidt Camera." Proc of the 2nd Asian-Pacific Reg. Mtg. On Astron.,eds. B. Hidajat and M.W. Feast (Jakarta: Tira Pustaka): 335-340. Gehrels, T. 1984. "CCD Scanning for Asteroids and Geostationary Objects." Abstract in B.A.A.S. 16: 700. Gehrels, T., and R. P. Binzel. 1984. "The Spacewatch Camera." The Minor Planet Bulletin 11: 1-2. Gehrels, T., H. Boesgaard, L. R. Doose, J. E. Frecker, R. S. McMillan, M. L. Perry, J. V. Scotti, E. M. Shoemaker, and D. Tholen. 1984. "A CCD System to Detect Fast- Moving Asteroids." The Spacewatch Report, No. 3, eds. T. Gehrels and M. S. Matthews. Gehrels, T., J. E. Frecker, R. S. McMillan, M. L. Perry, and J. V. Scotti. 1984. "Four Modes of CCD Operation." Abstract in B.A.A.S. 16: 986. Scotti, J. V., J. E. Frecker, T. Gehrels, and R. S. McMillan. 1984. "Astrometry Using the CCD System of the Spacewatch Camera." Abstract in B.A.A.S. 16: 902. Scotti, J. V. 1984. "Comets for 1985." Journ. A.L.P.O. 31: 26-28. Gehrels, T., C. B. Bornhurst, J. E. Frecker, R. Goff, R. S. McMillan, M. L. Perry, J. V. Scotti, and W. R. Stone. 1983. "The First Spacewatch Camera." Abstract in B.A.A.S. 15: 793. Gehrels, T., 1983. "The Spacewatch Report No. 2," eds. T. Gehrels and M. S.Matthews. Gehrels, N., T. Gehrels, R. S. McMillan, J. V. Scotti, and J. E. Frecker. 1983. "Optical Monitoring of the Field of the Gamma-Ray Burst of 1979 Nov. 5." Abstract in B.A.A.S. 15: 939. Gehrels, T., and G. Schilling. 1983. "Project Spacewatch jaagt op Planetoiden." Zenit December: 496-502, (in Dutch). Gehrels, T., 1982. "The Spacewatch Report No. 1," eds. T. Gehrels and M. S.Matthews. Gehrels, T., and R. S. McMillan. 1982. "CCD Scanning for Asteroids and Comets." Sun and Planetary System. eds. W. Fricke and G. Teleki. (Dordrecht: D. Reidel Publ. Co.): 279-284. McMillan, R. S., and C. P. Stoll. 1982. "Software Simulations of the Detection of Rapidly Moving Asteroids by a Charge-Coupled Device." Proc. SPIE 331: 104-112. Gehrels, T. 1981. "Faint Comet Searching." Icarus 47:518-522. Gehrels, T. 1981. "On a Collision Course with the Earth." Lá Astronomia 13:3-9, (in Italian).